From a writer “whose genre-jumping refusal to be pinned down [makes him] an exemplar of our era” (NPR), a new book that confirms his power to astound readers. As a child Geoff Dyer spent long hours making and blotchily painting model fighter planes. So the adult Dyer jumped at the chance of a residency aboard an aircraft carrier. 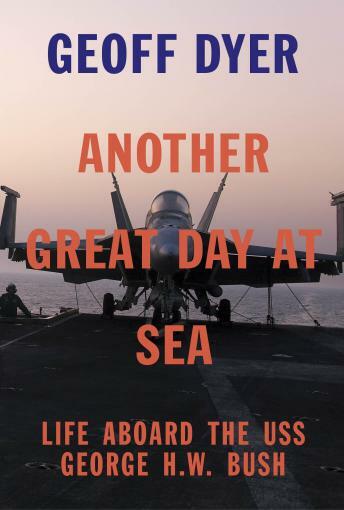 Another Great Day at Sea chronicles Dyer’s experiences on the USS George H.W. Bush as he navigates the routines and protocols of “carrier-world,” from the elaborate choreography of the flight deck through miles of walkways and hatches to kitchens serving meals for a crew of five thousand to the deafening complexity of catapult and arresting gear. Meeting the Captain, the F-18 pilots and the dentists, experiencing everything from a man-overboard alert to the Steel Beach Party, Dyer guides us through the most AIE (acronym intensive environment) imaginable. Another Great Day at Sea is the definitive work of an author whose books defy definition.